Take note. You have been given a tremendous amount of advice from friends, family, college tours, and counselors about the glory of college: game days, pizza, and new friends. But, there are still surprises in college- and it isn’t always your best friend from home visiting you. Don’t get me wrong, there will be great surprises, but there will also be times that life sneaks up on you. Don’t fret- you only need to be responsible for your meals, studying, working out, laundry, doctor appointments, making new friends, having a social life, making money, and more.. really, it’s nothing! 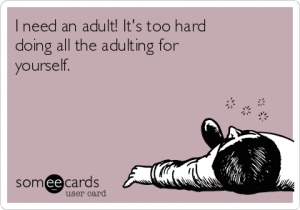 Living life as an adult is not easy, but this guide gives “adulting” life hacks that will make the transition smoother. 01. Stop comparing yourself to others…. really, don’t think the person in lecture has it more figured out than you. 02. Never send your resume as a word document (unless asked). It’s more professional to always send it as a .PDF file. 03. Eat a spring roll at the food trucks for a $3 meal that is filled with protein, avocado, and vegetables…did I mention avocado? 05. Start getting involved on campus now, don’t get involved Junior year, I repeat don’t get involved Junior year- your resume will thank me!